Diversified equipment: To satisfy different product needs from our customers, we have various pneumatic presses, spot welding machines, riveting machines, tapping machines, lathes, and spring contact machines. We can satisfy the diverse needs from customers. 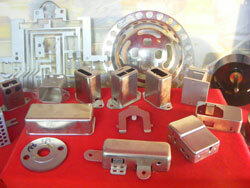 Diversified mold: Present mold types include fine progressive dies, high speed progressive dies, compound dies and step dies. Processing methods include: blanking, bending, deep drawing, flanging and sizing. For all of the above dies and processes, we have an abundance of experience and can offer reliable quality and delivery time to our customers. Complete post-process: For the post-processes after stamping, we use Central Plating Industry for we zinc, tin and nickel plating. There are other subcontractors that we use for Electric Coating, Power Baking Paint, Liquid Baking Paint, and Oxygenation. High coordination: To satisfy the requirements of quick response and stock reduction from our customers, we have our own mold making and maintenance department. Jumpway designs and improves molds utilizing our vastly experienced staff. 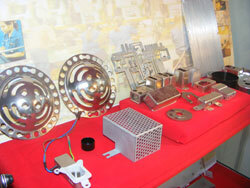 We are very proficient at mold repairing and standardization. 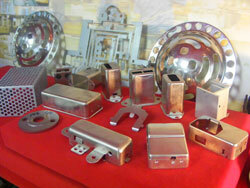 Our molds are maintained to the highest condition for production. Furthermore, we have an integrated production schedule, from material stock to production and finished product warehouse control. We adjust production schedules quickly according to the need of our customers through MRP system (Material Requirement Planning). Jumpway provides customers with high flexibility and reliable delivery on time.